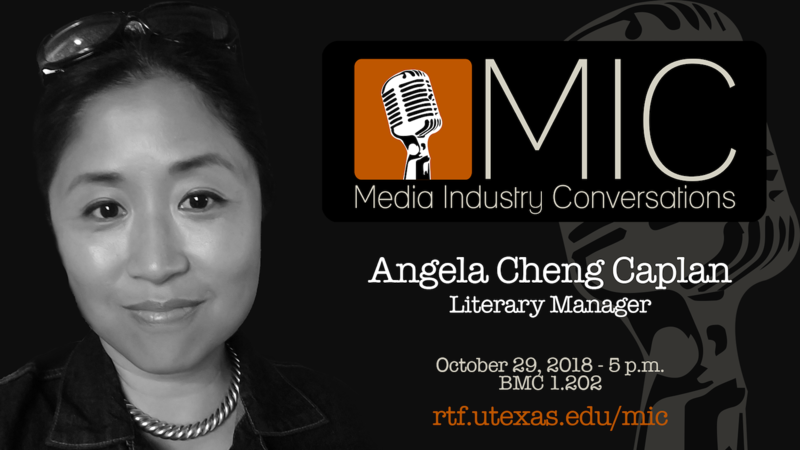 When: Monday, October 29, 2018 - 5-6:15 p.m.
Angela Cheng Caplan discussed her career trajectory, her roles and responsibilities as a Literary Manager, and her views on the current state of the media industries. Angela Cheng Caplan is the president and CEO of Cheng Caplan Company, Inc., an independent literary/talent management and production company based in Los Angeles, California, representing Academy Award nominated filmmakers, Emmy Award winning television show creators, international best-selling and award-winning book authors, Tony Award winning playwrights and world-famous comic book creators. Two weeks after finishing college, Angela was in Los Angeles working for a talent and modeling agency. By the age of 25, Angela became Hollywood’s youngest literary agent. After working for two prestigious agencies in Los Angeles and New York City, she opened Cheng Caplan Company, Inc.
At Cheng Caplan Company, Inc., Angela and her associates specialize in working with world creators and storytellers who can work across narrative forms, including live-action, animation, film, TV, digital, theater, publishing, and video games. Angela’s clients come from all over the world, and bring their diverse life experiences to their work. Angela has mentored filmmakers and executives for the San Francisco International Film Festival, on behalf of the Center for Asian American Media, and has served on the boards of Organization of Chinese Americans, DragonSprouts, which advocates the benefits of bilingual Mandarin-English education in the United States, and CAPE, the Coalition of Asian Pacifics in Entertainment. Angela holds a BA in Semiotics-French from Brown University in Providence, Rhode Island, and lives in Los Angeles with her husband and their three children. Back to MIC home page.